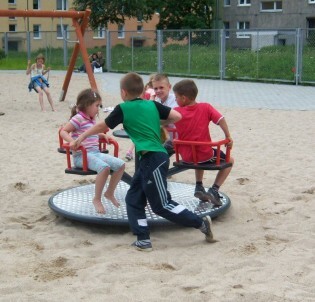 Roundabout with 4 seats, made of galvanized steel, powder painted. Available diameter of the roundabout: 1,7 m. The floor is covered by PE plate. Thanks to this solution the roundabout's floor is soft (more safety) and anti-slip. Moreover it is not heating during sunny days and is not freezing during the winter. Aluminum floor option is also available.